3.9 out of 5 based on 38 bloggers and 8 commenters. 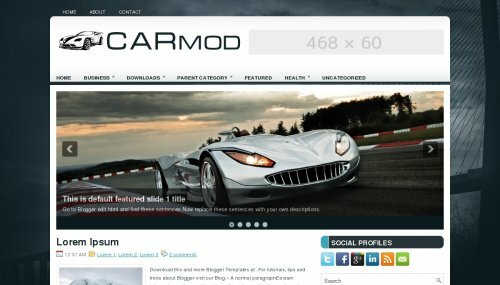 CarMod is a free blogger template adapted from WordPress with 2 columns, right sidebar, rounded corners, ads ready, slider, social bookmarking icons, posts thumbnails, tabs, drop down menu and well designed threaded comments. This template is so profesional looking and clean. So I am going to use this theme and I wanted to know how to put stuff categorized under the different pages that come with it. These are the pages that are right above the sliding image bar. In the template they are like “Business” > “Internet, Market, Stock”. I tried to make this questions as least confusing as possible. Thanks for this great template. Is there a way I can remove READ MORE links. Those can be easily removed from the template by going to EDIT HTML. Click drop down menu on your blogger dashboard, against your blog…click template and then EDIT HTML. Find for Market, business and stuff you want to remove. Change the area out of the HTML brackets with your desired text. My blog has that thing removed. how can i change the pict in slide? i want make some different picts.